‘We are looking for an artist or artists to collaborate with a group of local young people to produce an art work that harnesses the power of their digital energy to light up Blackburn Cotton Exchange this winter, bringing it to life for a whole new generation of audiences as an important new cultural venue for the town. 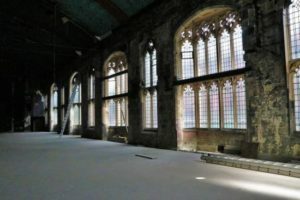 The work must be light based, as it will feature as an important focal point commission within the annual Blackburn Festival of Light but may include other elements. The final piece should be able to be shown for a run of 3 months from December 2018 – February 2019 without the need for invigilation, so must be viewable from the exterior of the building. During the light festival (15th December) however, audiences will be encouraged to enter the building, so this should be kept in mind when producing the final work. The deadline to apply is Friday 21st September. For full info and how to apply, please see here.